Oh, hey, maybe things ARE coming together. There were definitely less footprints the last time we saw this place, right? But that’s it for Issue 4! Both groups of our heroes have made some progress and they even seem to be close together again…but towards what? In two weeks, on December 4th, we’ll have the cover for Issue 4, and Issue 5 will start on January 1st. It’s a bit of a longer break than we usually take between issues, but it should help us to rebuild a buffer. We hope! In the meantime, we’ll have new chapters of the Cato’s Story on the Prose site during our break. 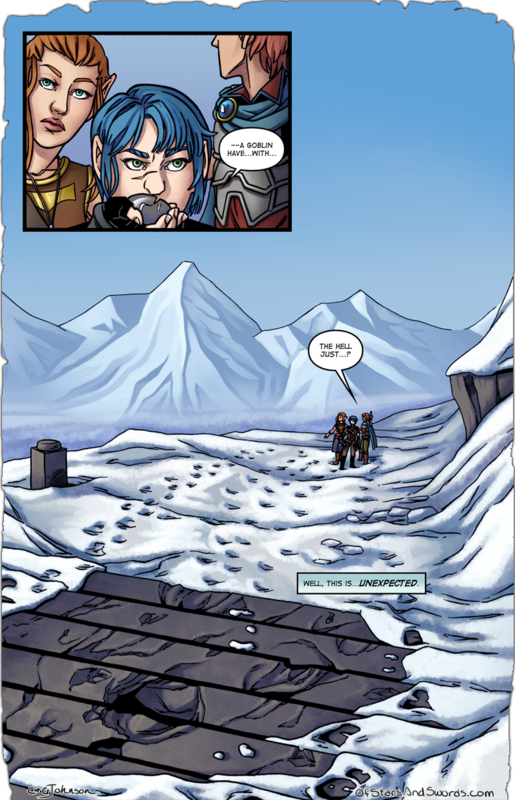 It’s very possible that there may be some hints as to what is happening in our comic over there, as well! And you can catch up on the story easily via the Issue buttons over on the sidebar. Issues 0-3 are also available to read in collected digital editions (with extras!) both through our store on Gumroad, where you can pay what you want for them, or on Comixology, optimized for reading on their app for phones and tablets! Issue 4 will come to both soon, as well! Finally, you can keep up with everything on our Facebook page or via our Twitter accounts, all of which are linked in the sidebar. Updates to the Prose page and anything else will be linked there as they happen!